Lovely, lovely, lovely. Brox deepens and layers her portrait of the Merrimack Valley (that she began in her first collection of essays, Here and Nowhere Else) through the lens of her family farm, and the life she and her parents have lived on it. Here we find meditations on apple orchards, her father's death, the mill towns of Lawrence and Lowell, the diminishment of the farming life in Eastern Massachusetts, and a moving account of the influenza epidemic of 1918. The latter essay, "Influenza, 1918," was something I stumbled across in The Georgia Review well over a decade ago, and I distinctly remember thinking at the time: WOW! There is a genre of writing that blends history and memoir, lyricism and real life? It knocked my socks off. Now it's the reason I'm trying to write creative nonfiction myself. I can only hope I might be able to produce something as moving and as elegant as Brox's Five Thousand Days Like This One. Highly recommended. This book tells the fascinating history of the folks who settled the Lawrence area, and Brox's own ancestors. After reading her other two books, this one seemed to fill in a missing link in the story. She goes into the detailed history of the town where she grew up, framing the sections about the farm in the larger story of other farms just like it. What I love about Brox's writing, and this book in particular, is the clarity of the love she has for the places and the histories she is writing about. Reading her books is a little blessing. They are simply-told, age-old stories, narratives steeped in hard work, tradition, and history. They don't cover a lot of ground, nor are they broad in scope, but the little histories and the specific places that Brox writes about come alive on the page. Brox looks at the history of Lowell and Lawrence, Mass., and the surrounding farmland, and how her grandparents came from Lebanon and Italy to work in the mills, and deal with the Influenza epidemic of 1918 and World War I, and what Henry David Thoreau had to say about the farms and industry in the area, and her father's death and the development and loss of agriculture there, and it's all just beautifully written. It's good to read slowly and savor - a chapter (good as a free-standing essay) here and there.Also, the excerpts from mill girls diaries are incredible. Brox did a great job of bringing in historical documents (and has a nice "Notes" section in the back so you can go and read the original stuff). I went to the library in search of another book and found this one on the shelf. It is about my hometown and Brox farm... I know that place. The story took my back to my childhood and beyond. Nestled in my heart and soul the beauty and peace of rural new england and the ebbs and flows of the seasons. I was hoping for more details about the farm, which I think I will find an her other books, but I found much more of the how and why of these rural farms and their past, present and future all nestled within the pages of this book. Jane's stories warm and comfort me and take me to the wonder of my hometown and surrounding towns. Growing up on a farm in Lawrence, MA, and living there still, after her father’s death, Jane Brox writes a memoir of Middlesex County, MA. She and her husband still keep a small orchard of fruit trees, but this is not all about farming. I picked it up because of the chapters on the mills along the Merrimack River, and the big strike that took place in Lawrence in 1912. She also writes about the flu epidemic in 1918. I believe that I may have read articles by her previously, perhaps in Yankee magazine. This memoir, feels similar to Ondaatje or Guterson in the sense that it is Jane Brox's memoir, but she is not the main fixture, instead the land of the Merrimack Valley, and its orchards over the course of industrialization of the region are its focus. It's also an immigrant narrative, of sorts, as Brox tells stories of her own family's immigration to the U.S. and their interaction with the history of the land and landscape. Oh, I loved this book. It's about her family's farm in Massachusetts and about the area's mill history and about a million other things. You think it's about her life and her history but as you are reading you realize it is about yours too. Writes like a poet. Incredible. Borrowed from Endicott College library. Merrimack Valley farm family history (Massachusetts). Lowell and Lawrence mils, growing apples, mild cows, etc.Excellent - quotes Thoreau a lot. I liked the apple chapter and the fact that I knew most of the area that was being described. The references to Thoreau were good too. This was more a history of the land then family. Jane Brox writes compellingly of her family's history and the history of their farm in Massachusetts. I read it a long time ago, but I remember well that I loved this book. Highly recommended to anyone interested in memoir, rural life, and family dynamics. Brox writes nonfiction from a poet's perspective. 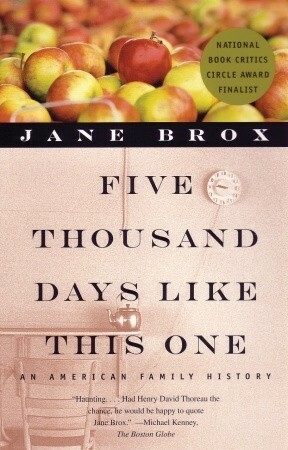 Brox is a lovely, lyrical but plain writer and these essays her family's apple orchard hypnotyze you to a specific place and time. Jane Brox - JANE BROX is the author of Clearing Land, Five Thousand Days Like This One, a finalist for the National Book Critics Circle Award, and Here and Nowhere Else, which received the L. L. Winship/PEN New England Award. She lives in Maine"